Data governance can boost efficiency, save money, improve an agency’s product and build opportunity, all the while reducing risks of data breaches, privacy violations and distributing bad data. 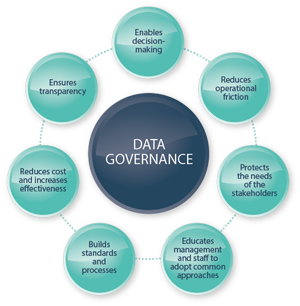 However, data governance requires more than just a few information technology workers and a simple project outline. It’s a strategic, long-term process that requires participation and commitment of IT and business management, as well as senior-level executive sponsorship and active consultation with internal and external stakeholders. It adds rigor and discipline to the process of managing, using, improving and protecting organizational information. Effective data governance can enhance the quality, availability and integrity of data by fostering cross-organizational collaboration and structured policymaking. 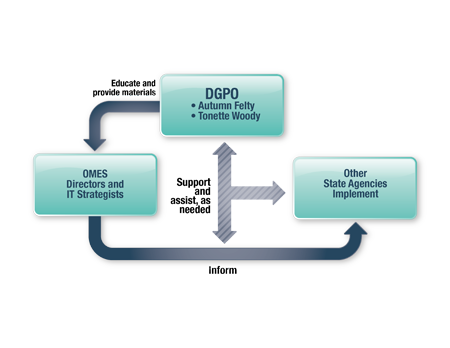 The service-oriented Data Governance Program Office is here to help state agencies begin data governance programs. The office provides education, materials, resources, process monitoring, document auditing and ongoing support to ensure the state’s data assets are the highest quality, managed appropriately and accessed securely for decision-making and policymaking. Find out more by reading the overview and contacting the OMES Information Services data governance team at datagovernance@omes.ok.gov.